Bob Bryan addresses the shot at hand, while Mike Bryan looks on during their finals match against Raven Klaasen and Leander Paes Sunday at the Delray Beach Open..
Donald Young in Sunday's final at the Delray Beach Open. 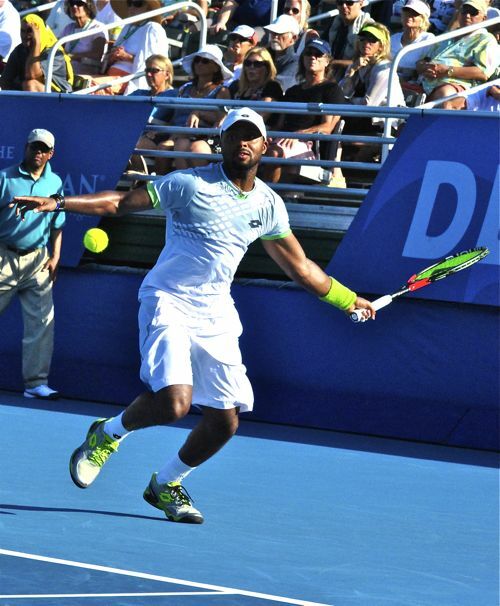 DELRAY BEACH — Two questions faced American Donald Young as he took on Ivo Karlovic of Croatia in Sunday's singles final of the Delray Beach Open by the Venetian. Could he break Karlovic's serve, what no one had done all week, and could he hold his own? In short, the answer two both questions was no. For the fifth time in the tournament, Karlovic boomed his powerful serve past his opponent without surrendering the advantage. He collected 13 aces to break the tournament record for the week at 92. He held the previous record, 89, set in 2010. In the final game, his serves exceeded 140 mph. Twice. "That's what he does," Young said. "He's a server. You've got to focus on your own serve, and I didn't do a great job. I didn't get into a rhythm." At one point in the second set, Young had three break points but couldn't convert. He had break point in the final game but Karlovic responded with three straight aces, 142 mph, 138 mph, 142 mph. And it was over. "He played well, to be honest. He beat me," Young said. It wasn't just Karlovic's serve. He plays a serve-and-volley style, charging the net after smashing the ball at his opponent. At 6-foot-11, Karlovic is an intimidating presence and that helped disrupt Young as it had his other opponents during the week. Karlovic, who lives in Plantation, said he had confidence in his serve throughout the match. When faced with break point, he tried to remain focus. "On a few occasions, I was lucky," Karlovic said. "It isn't easy being down love-40, but I believed I could do it." Throughout the tournament, Karlovic had played night matches. 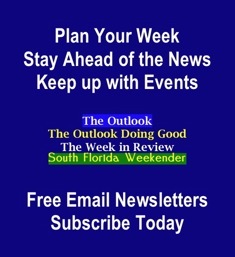 The final was his first daytime start, and the wind at the Delray Beach Tennis Center tends to be more of a factor. Karlovic double-faulted a number of times. "But I was able to get out of it. "It is unbelievable," Karlovic said. "It's really great. Also at my age, it gives me a boost of confidence." Karlovic turns 36 on Saturday. He is the oldest player to win an ATP tournament since Jimmy Conners did it at 37 in 1989. The doubles final, played earlier in the afternoon, was exactly what would be expected when the top two seeds compete. 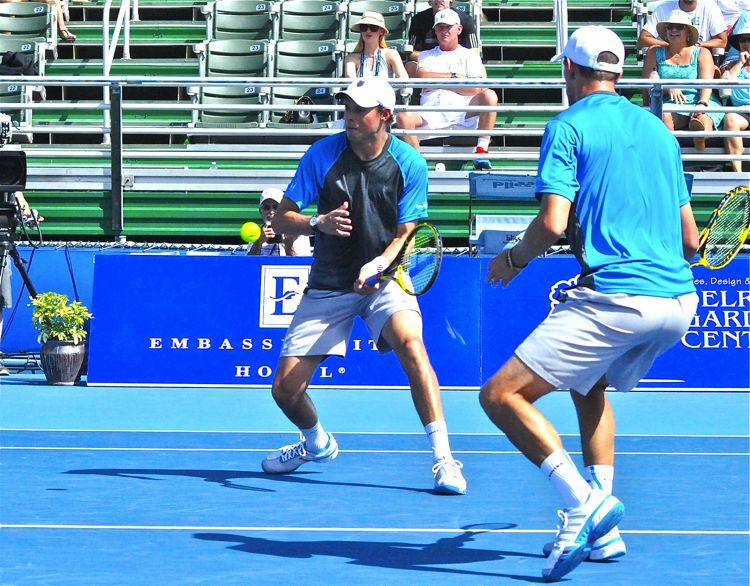 Americans Mike and Bob Bryan beat Raven Klaasen of the Republic of South Africa and Leander Paes of India 3-6, 6-3(4). Paes afterwards called the Bryans the "greatest doubles time of all time." It was the 42nd time that the brothers had played a doubles match against Paes. It was the 29th time that they've won. "We knew it was going to be tough, playing that guy," Mike Bryan said. "Raven is an up-and-coming star who's going to have a long, great career. It feels good to win our first tournament in 2015." It was the 155th career finals for the Bryans, and the 104th win and their third in Delray Beach. NOTES: Karlovic earned $84,250 for winning the tournament. Young took home $44,370. It was Karlovic's sixth career title, the first since 2013 when he won in Bogata. Perhaps not by coincidence, he didn't lose service in that tournament. He is now 6-8 in finals; Young is 0-2. The Bryans' payday was $26,980; Klaasen and Paes earned $14,180. NOT QUITE ENOUGH ... Leander Paes pounces at the net to score against the Bryan Brothers in the doubles final at the Delray Beach Open. 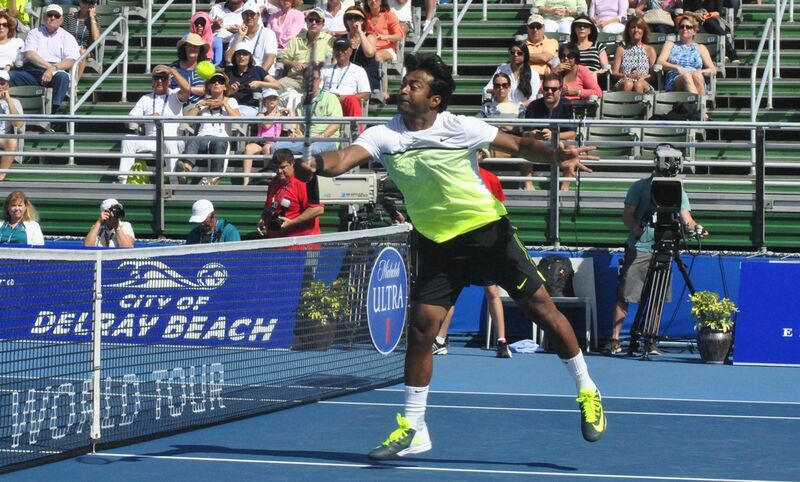 Paes and partner Raven Klaasen, however, came up short, losing in a tiebreaker, 3-6, 6-3(6).